I'm making progress in the vegetable garden. The first of three successive plantings of snow peas is producing now. They're planted against the supports in the back of the garden. The zucchini are taking hold and starting to blossom, although these early blossoms probably won't produce anything. The first row of green beans has sprouted, and I planted another row on Tuesday. I was out at 6:30 a.m. planting the last fifteen tomato seedlings. The bushy stuff on the right is oregano. The largest part of the garden is taken up by tomatoes. I planted the seeds in late March and raised them in the greenhouse. Now, thirty tomato plants are in the garden. There are six varieties: roma, brandywine, yellow jubilee, cœur de bœuf, beefsteak, and fireball. I kept five plants of each variety. Here's hoping the blight fungus stays away. I still have eggplant and chili peppers to plant out, but the hardest work is done now. Tasha was not interested in having her photo taken over the weekend. At least not by me. Ken was more successful. She, like most puppies, is a bundle of energy. She actually took a flying leap at Callie's head to give her a kiss on Monday. Callie just stood there, dumbfounded. She loves Bert the cat, too, and runs circles around him. They lie on the floor together and trade face licks. She still won't go down stairs, so we have to carry her. When we get to the bottom she tries to wriggle free and often takes a short dive, rolls over, and bounces back up to run out the door. This morning she woke me up around 03h30 to go outside. I got up, dressed, and carried her down the two flights of stairs. We got into the utility room and there was Bert. Tasha got all excited and I had to carry her outside to separate the two. Bert meowed and Tasha ran back into the house, having not done her business. So we went back upstairs and back to bed. An hour later, Tasha woke me up again. Dressed again, downstairs again, and this time no cat. Tasha pooped. Then back to bed. After a half-hour, at 05h00, the garbage truck roared up the hill. Tasha was up for good, and so were we. This is our street, looking east toward the sunrise early one recent morning. Just beyond where the street disappears behind the trees, it goes down a relatively steep hill into the valley toward the river. Just behind where I'm standing, the street becomes a dirt road through the vineyards. We and our neighbors try to keep the grass cut along our portions of the road. Sunday was a hot day, but today should be a little cooler. Still feels like summer, though, and that's nice. I will be harvesting the first of our snow peas today. I was surprised to see so many on the plants yesterday. We'll stir-fry them with some shrimp for lunch. I've probably used that line before, but what the heck. 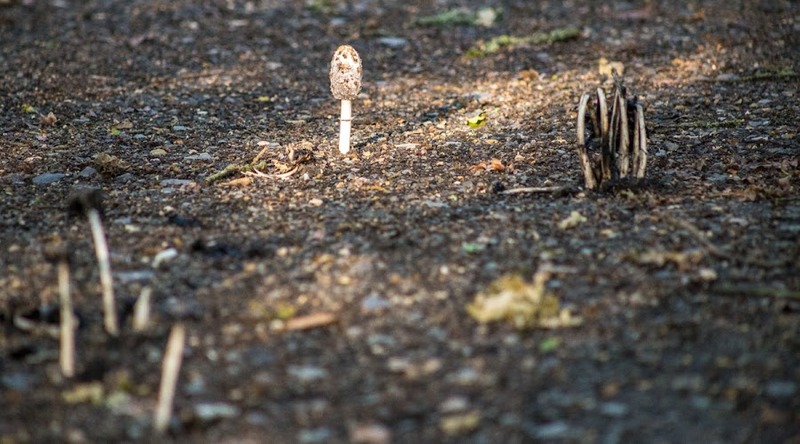 I was surprised to see these ink cap mushrooms poking up through a gravel road (it's the artsy organized neighbor's road to nowhere). I've seen them here before, of course, but normally in the fall, not in the spring. The morning sun shone through the trees and lit up the one whole mushroom in the bunch. The others were past their prime and dying back. On Saturday I got to the market and, in addition to strawberries, got a cucumber, a head of lettuce, and a bunch of radishes. We ate radishes as an appetizer, the French way, with baguette, butter, and salt. Yum! As planned, I went to the hardware store early on Friday morning to find something for hanging tools in the garden shed. I found a product that looked promising and took two of them. I decided to put one on each end of the shed where the roof is highest. That means that one hanger is just inside the door and the other faces it on the opposite wall. Callie and Tasha supervised my work in the garden shed. Installing the hangers meant drilling holes in the masonry walls of the shed. That requires electricity, and the shed is about as far away from the house as you can get on our lot. Back when I was doing my own hedge-trimming, I got two very long spooled extension cords that I could connect together to power the electric trimmer. They came in handy for powering the drill in the shed. One of the tool hangers installed and loaded up with rakes and things. The first hanger went up pretty easily. I had a minor problem with the second one: the drill moved a little and one of the three holes was not exactly where it should have been. But it was only off by a little and I got it to work without having to drill another hole. This is the hanger just inside the shed door. 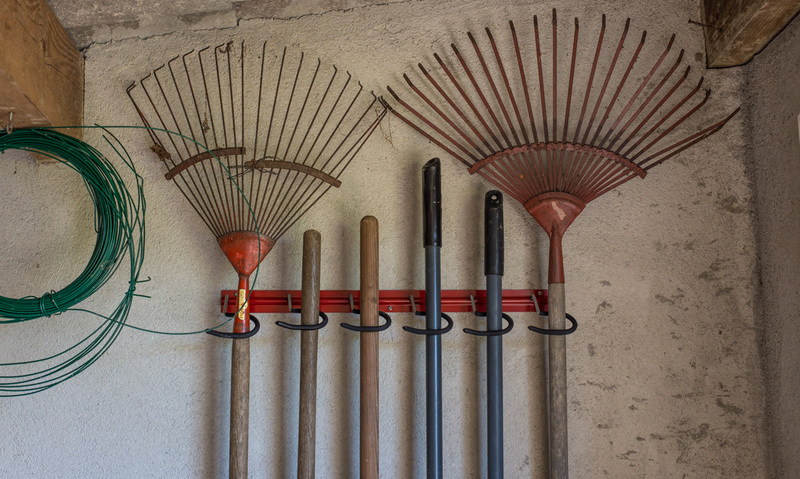 More rakes and things. The only other "problem" is that there aren't enough hangers for all the things I want to hang. So I decided that the tools with closed handles can hang on nails on the back wall of the shed. There are some existing nails, but I think I'll add a few more so that everything can hang. Spades and forks hanging on nails along the shed's back wall. Everything is still not back inside the shed, but I'm getting there. And I have to make a trip to the dump soon to get rid of the junk and the chemicals. The dump has a special collecting point for hazardous materials like old paint, used motor oil, and other things that need special treatment. We wore ourselves out on Thursday morning. First, we emptied the garden shed. The lawnmower, rototiller, and wheel barrows were easy. 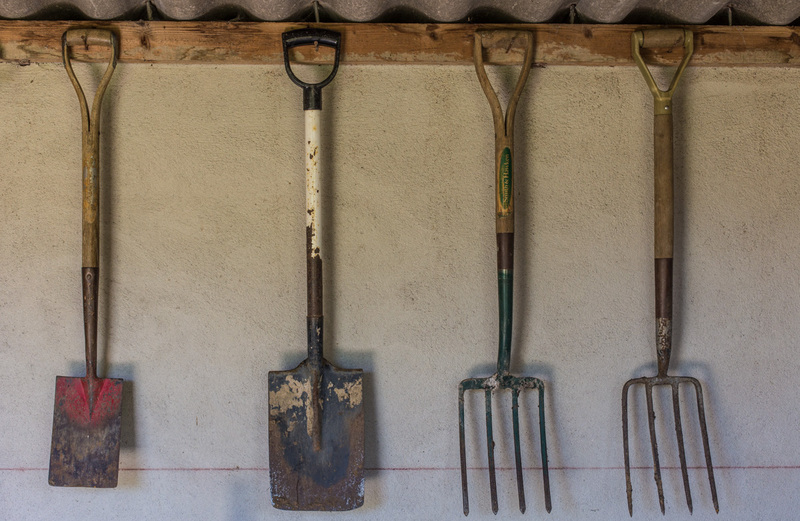 Then came all the tools like rakes, shovels, hoes, and other long-handled things. 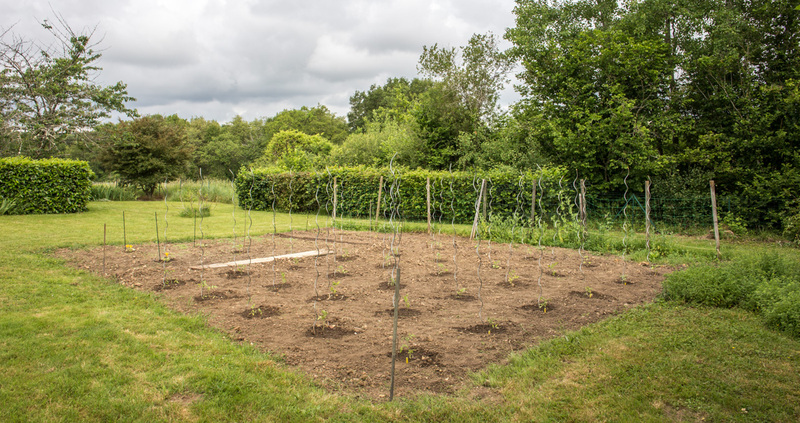 The tomato stakes, both metal and wooden, and the collection of various and sundry poles and sticks. Hundreds of little seedling pots and trays in every condition. Odds and ends. And garden chemicals (way-too-old herbicides, pesticides, fertilizers, etc., from the previous owner). 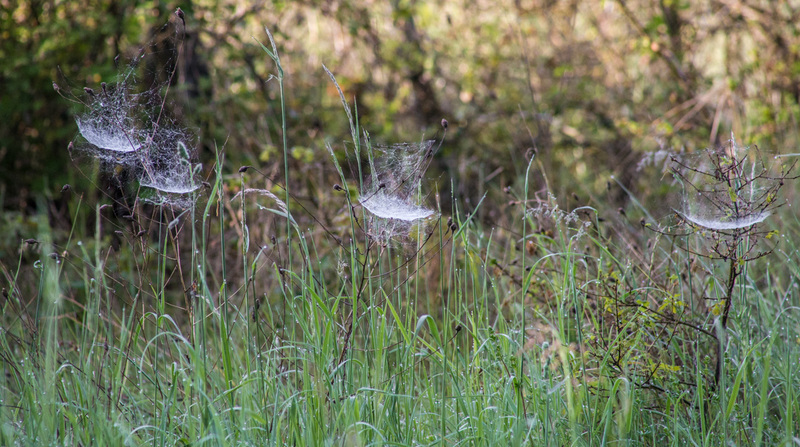 These outdoor spider webs are tame compared to what I cleaned out of the garden shed on Thursday. 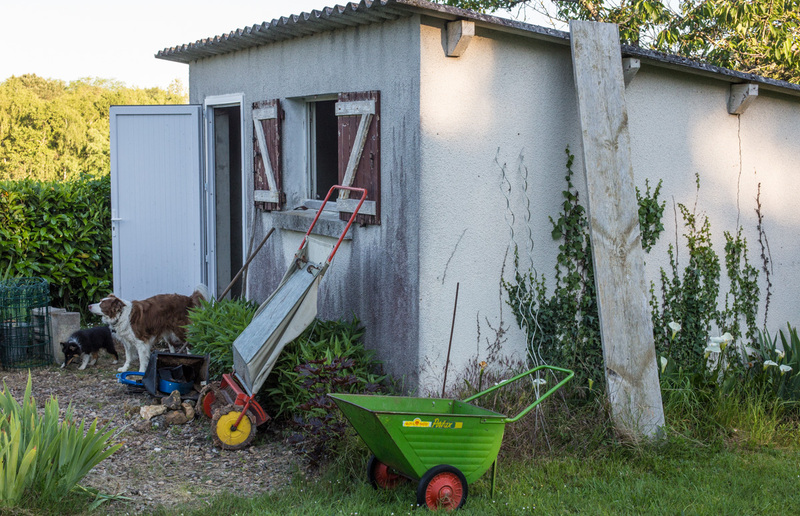 When the shed was empty, I swept the floor and walls. Then I used the shop-vac to clean the walls, ceilings, and the floor of the hundreds of spider webs, spider eggs, spider bodies, and actual live spiders. Yuck. We boxed and bagged a lot of junk for the dump, including all those old chemicals. I originally kept them when we first moved here thinking they might come in handy, but I've never used them; they're just too old. This is probably the third time I've emptied the shed in fourteen years. The first time, that first year, was the worst. The shed was an unorganized repository for stuff that hadn't been used in years and I could hardly get inside, it was so crammed with junk. And the rotted door was patched with plywood. After a few months we had a new, lockable, door installed. As with all storage space, it quickly got re-filled with junk and less and less organized, so periodic clean-outs are more than necessary. Now we start the process of putting it back together. 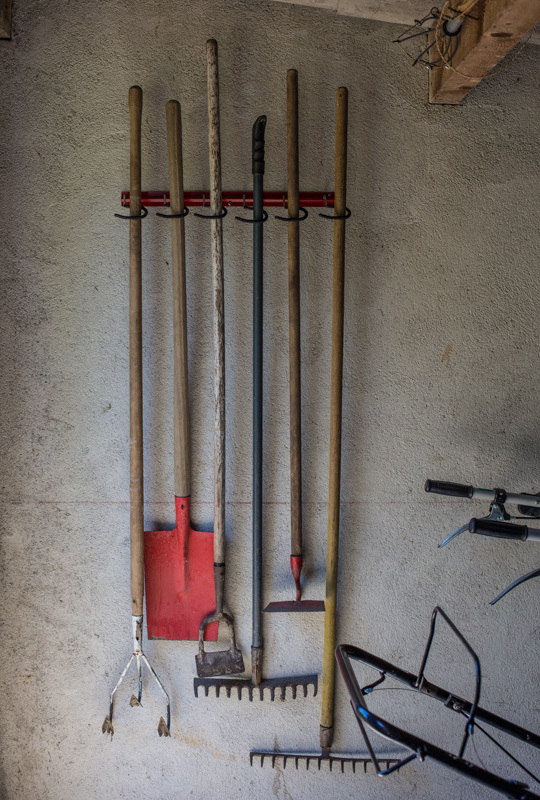 I'm going to the hardware store to look for those things that I can hang rakes and shovels and other long-handled tools on so they're no longer leaning up against the wall (and falling over every time I take a tool out). Of course, I have no photos of the process, but I'll try to remember to take some of the result. When the conditions are right, fog forms in the river valley as the sun rises. Sometimes it's a very shallow layer, and sometimes it gets thick enough to rise up over the heights. And sometimes, like on this recent morning, it's in between, just coming up to our house without engulfing us. The small building with the white door (behind the hedge) is our garden shed. The weather right now is very pleasant. The mornings are cool, but not cold (I go out with Tasha in shorts and a tee-shirt in the early hours before sunrise). The days are warm, but not hot. We're making progress in the yard and garden and I've started planting the vegetable seedlings outdoors. 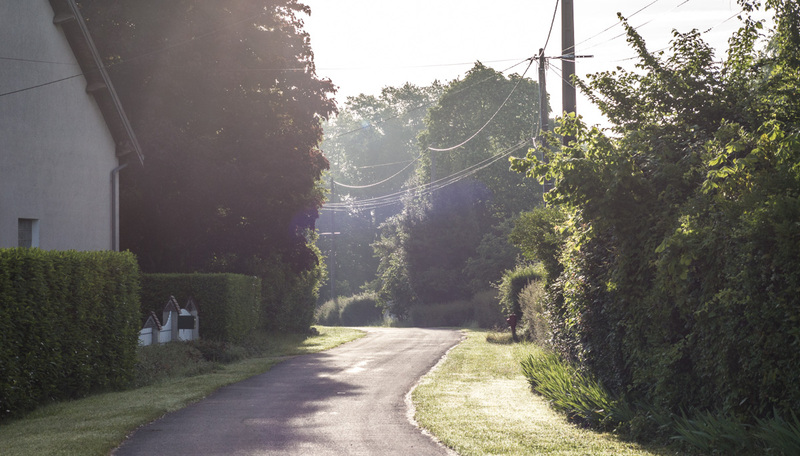 Today is a holiday in France (Ascension Day), so we're restricted to not making noise with lawnmowers or chainsaws. Friday or Saturday will be the grass-cutting day. I may get started on cleaning out the garden shed this morning. When the latest branch came down from the old apple tree, I forgot to take a picture before I cut it up with the chainsaw. You can see where it was in this shot, where the fresh cut is facing the camera. To the left of that is where another limb came down several years ago. 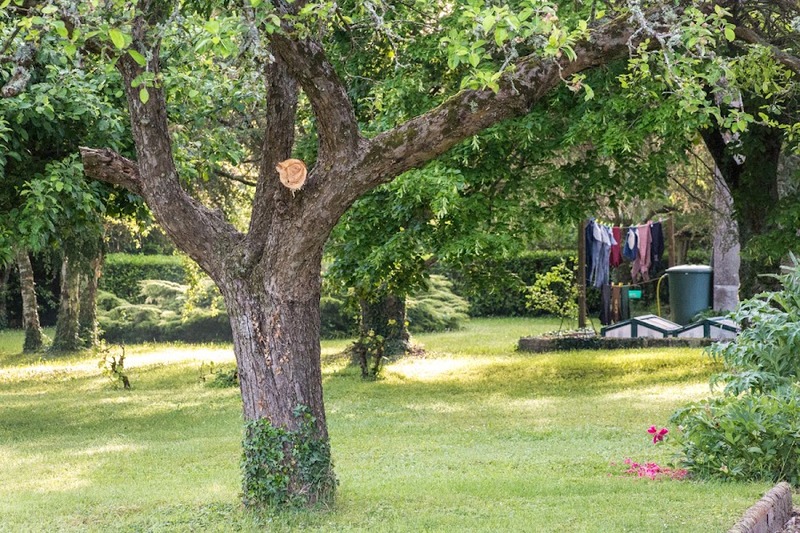 The old apple tree is the biggest of the four remaining apple trees in our yard. A friend of ours believes it's a Bramley apple. The tree is full of mistletoe, a parasite, and it will likely lose more limbs over the next years. One day we'll have to make the decision to take it down entirely. But it still produces apples and I use them in pies and applesauce, so we'll keep it as long as we can. Callie and Tasha take a break from running around in the sun. Taken on Saturday. We can really see her growing now. Her nose is longer and so are her legs. She's getting the lay of the land and she and Callie are playing together more. Tasha runs circles around the older dog, literally. And Callie is getting more comfortable having the little one around. Tasha is learning the rhythms of her new life chez nous. She even wants to go out for walks with Callie, but it's still a little too soon for that. I'm trying to get her to accept a harness, but she's not quite comfortable with it yet. It'll happen before too long. And, on the house-training front, we are doing very well. Tasha's new thing is to wake me up at 4:30 in the morning by putting her paws up on the side of the bed and licking my hands. I get up, we go out, she does her thing, then it's back to bed. It's better than having to clean up a mess in the morning. For the past two or three years, since one of the vineyard parcels out back was planted with new vines, the grower has used this solar-powered device to try to keep deer from coming in to nibble on fresh shoots and grape flowers. One of the vineyard workers told me that it emitted a high-pitched noise that people couldn't hear, and it's true that I didn't notice any sound that first year. But last year and this year, the speaker emits very audible sounds at regular intervals. They're especially noticeable in the early morning hours when all else is quiet. Notice the little bird perched on one of the vineyard posts. I can only describe the sounds as wild animal noises. Nearly blood-curdling (especially at four in the morning) screeches and howls, punctuated with a series of simulated gunshots. I notice the noises when I sleep with the windows open. And also now that we take Tasha outside in the wee hours. The first time Tasha heard the thing she turned tail and ran back into the house. I hope it works just as well on the deer. Once the grape vines set fruit they'll turn the sounds off for the season. I'm thinking that this coming week will be the week to get the tomato plants in the ground. I'm hoping to plant the zucchini seedlings out today, and I want to plant a row of green beans, too. Then there are the chili peppers -- I want to put some outside and keep some in pots in the greenhouse. It's also time to plant basil seeds and a few other herbs in the greenhouse. Tomato seedlings last week. They're even bigger now. The rains seem to be over for now, so the dry and warmer weather coming up over the next few days should be good for getting the garden in. I also have to get the taxes (French and US) done this week. Our French returns are due on the 31st and the US returns are due in early June (citizens residing outside the US aren't subject to the April 15 deadline). With all the rain we've had in the past few weeks, the grass has really grown. 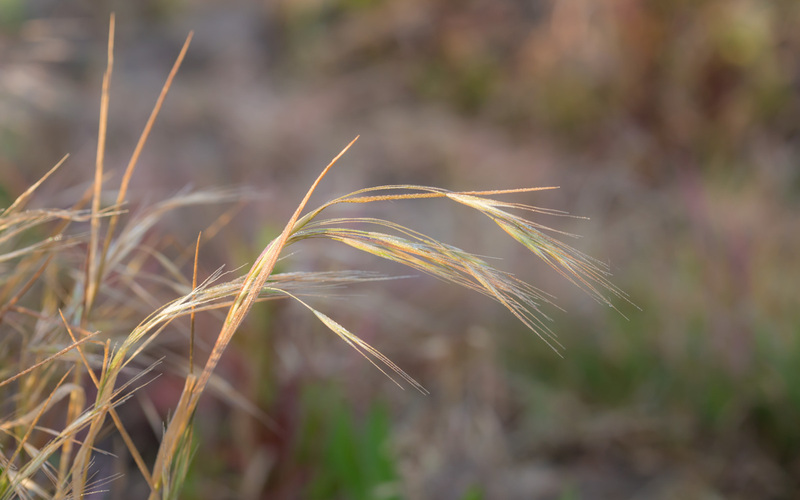 I've mowed our grass a few times, but the tall grasses out in the fields among the vineyards have really taken off. And it's tick season and there are a lot of them this year. Not so much a problem for us (although we are careful), but for the dogs and cat it's a real pain. I imagine that the deer and foxes (and other wildlife) are not enjoying tick season this year. They all get Frontline, but that just kills the tick after it attaches, so we often find a feeding tick on the animal before it drops off. We have a pair of little tick forks for removing them. I can tell that the animals appreciate having the ticks removed. If we don't get them, they eventually die, but it's no fun finding a bloated dead tick on the floor or, worse, stepping on one. Yuck. 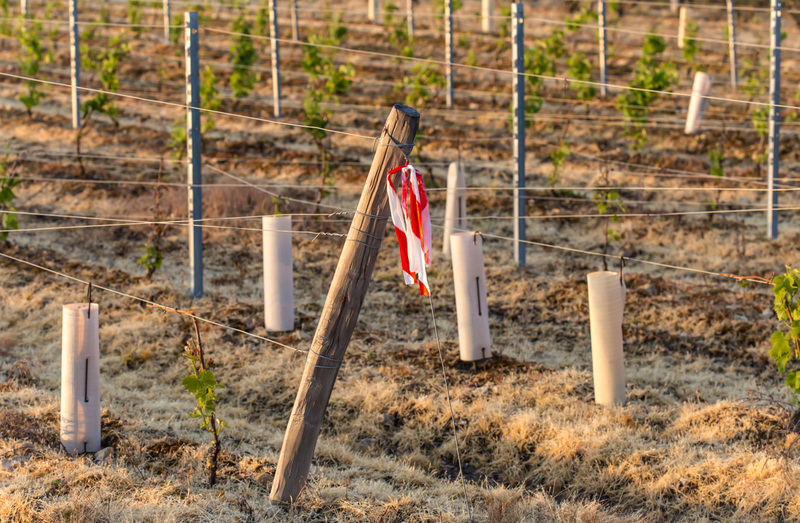 The grower and winemaker that owns most of the vineyard parcels out back hangs these flags at regular intervals on the posts at the end of vine rows. I've been seeing them for years, so a while back I asked about them. They're markers to tell him which rows to drive the tractor along when he's spraying the fungus preventative. Pretty simple. This vineyard parcel is only a few years old. The beige sleeves are protecting some newer vines planted to replace some that didn't make it. We had a lot of rain on Thursday, but I haven't yet read the rain gauge. We were expecting around an inch for the day. Just after falling asleep last night, I was awakened by the screeching of fighting cats outdoors, then almost instantaneously, the mad barking of Callie as she jumped off the couch and ran downstairs. Later, at three-thirty this morning, Tasha was active. I got dressed and took her out (with a flashlight this time). She pooped. Back to bed, but not back to sleep. Tasha was up for the morning. Is it nap time yet? UPDATE: The rain gauge reads 18 millimeters, much less than expected. There is a patch of campanules (bellflowers) outside our front door that have been there since before we moved in nearly fourteen years ago. Since then, I moved some to another location and from there they've started to spread. I also planted some in the real fake well out in the back yard; this is a photo of those. They do alright in the well, except they get a little crowded by the mint that I also planted in there. That bar on the right is one of three wrought iron uprights that are part of the well. This year, the mint isn't coming back as strongly as it has over the last few years and the bellflowers are looking better. I'd be happy for them to take over once the mint runs its course. Since the April freeze, the grape vines out back have seriously slowed down. I do see signs of recovery. Vines that lost all their early green growth are sending out new leaves and, if I'm seeing things right, some are producing flowers. Vines that made it through the freeze with some or all of their leaves and buds intact are definitely producing flowers. I get the impression, however, that there are many fewer flowers than there might have been. These grape flower buds will open very soon and, if all goes well, will become a bunch of grapes. I got the grass cut on Tuesday and the back yard is looking pretty nice. 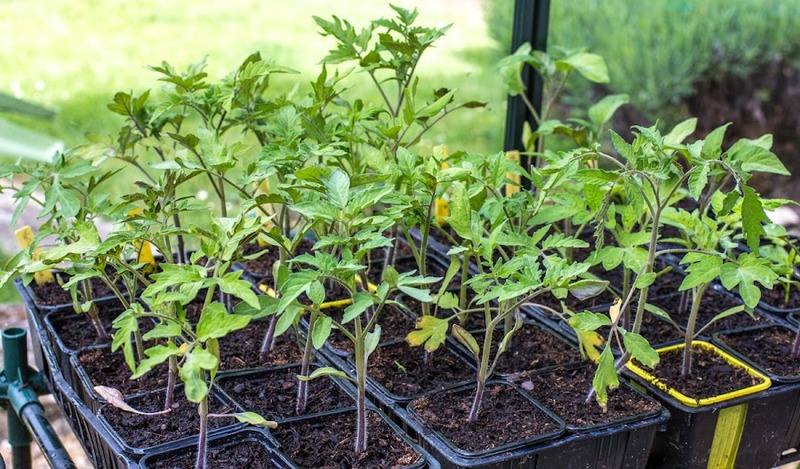 We're expecting a couple days of serious rain, so I'm holding off on planting out the tomatoes lest they get battered down; they're fine for now in the greenhouse. A lot of rain also means that the garden plot will be a soggy mess for a while. No fun for planting. We'll see how things go. 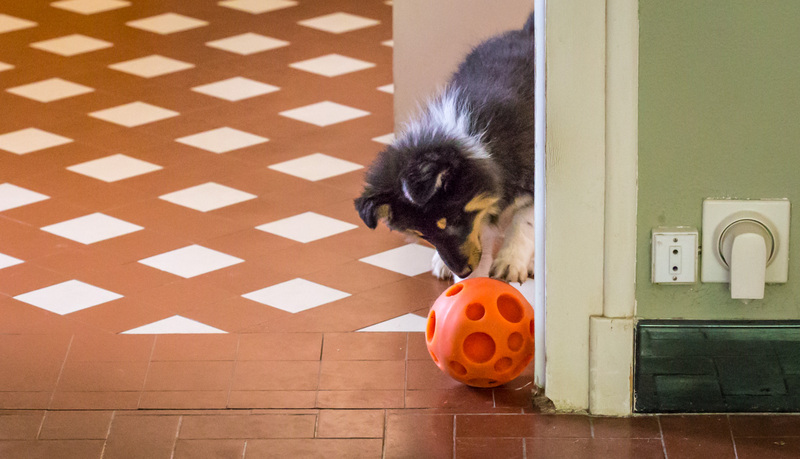 Tasha is learning how to play with the tricky treat ball. This is Callie's favorite toy, given to her by our friends C&J back when Callie was a puppy. She plays with it every day. I fill the ball with little treats. The dog pushes it around the floor and the treats fall out. Then she gobbles them up. There's something tasty in there, I just know it! Callie learned how it worked in just a few hours. Now Tasha is learning. At first she just followed Callie around the room and ate up any treats that Callie missed. 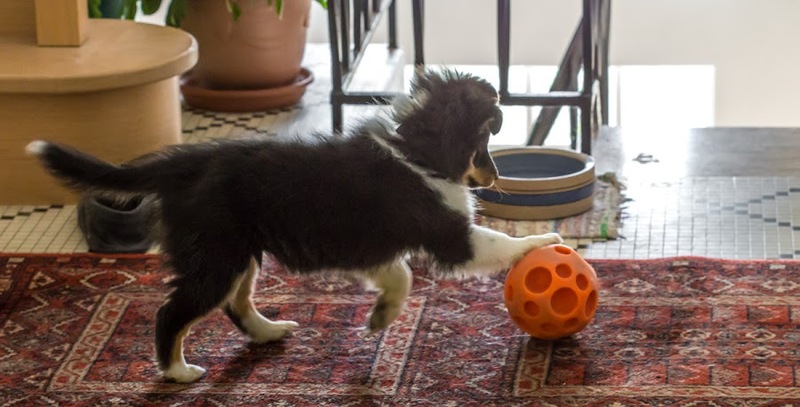 But now she's learned how to push the ball around on her own. And they're playing with it together. She seems to be a very smart dog. And I'm not just saying that. Ok, maybe I am. Call me a proud dad. Jumping onto the tricky treat ball. The other day, a pretty large dead branch broke off of the big apple tree in our yard. That tree is slowly coming to the end of its life. On Monday, I got the chainsaw out and cut it all up into burnable logs and stacked them with the other firewood. And I forgot to take photos. Local strawberry season is in full swing. For the past few Saturdays we've been getting strawberries, the variety called gariguette, from one of the local growers at Saint-Aignan's weekly market. So far, I've been using them for strawberry shortcake. I make our friend Tom's biscuit recipe for the shortcake; it's easy and makes four good-sized light and flaky biscuits. With apologies to Tom, I've modified his recipe a little: all-butter instead of butter and shortening, and plain yogurt in place of buttermilk. We top our dessert with a dollop (or two) of crème fraîche. 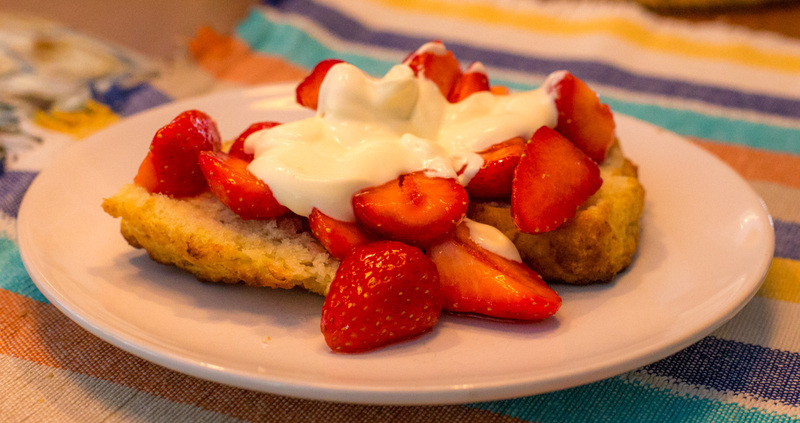 Fresh strawberry shortcake for dessert. Strawberries are among my favorite fruits and they're so good in season. Another good way to eat them (besides just as they are) is to marinate them in red wine or port (or even balsamic vinegar). Fraises au vin rouge is a classic, although many recipes tell you to simmer the wine with sugar and vanilla, eliminating the alcohol, and letting it cool before adding the strawberries. I just let the fruit marinate in the wine, alcohol and all. 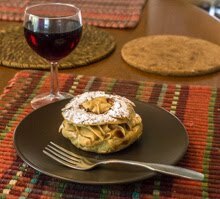 The tartness of the berries and the roundness of the wine really go well together. 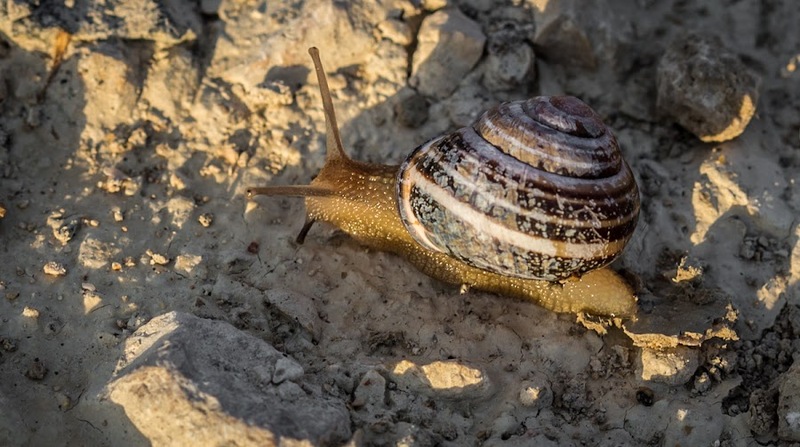 I almost stepped on this snail the other morning as he "scurried" across the dirt road out in the vineyard. He withdrew into his shell (like that would have saved him), but I saw him and was able to adjust my step. I waited about thirty seconds and he came back out of his shell and continued across the road. I like that his eyes show up in the photo. I really shouldn't call it a "him." Most snails are hermaphroditic. I won't get into the details of their reproduction here. I'm still having my morning coffee. If it's not one thing, it's another, as Roseanne Roseannadanna's father used to say. On Thursday night around nine o'clock, I took Tasha outside for the last time before bedtime. We wandered around a bit with no result. Then, suddenly, it started to rain. And thunder. Tasha turned and ran back into the house to get out of the rain (and so did I). We spent the next hour with Callie barking at the thunder and Tasha barking at Callie. Then, finally, sleep. 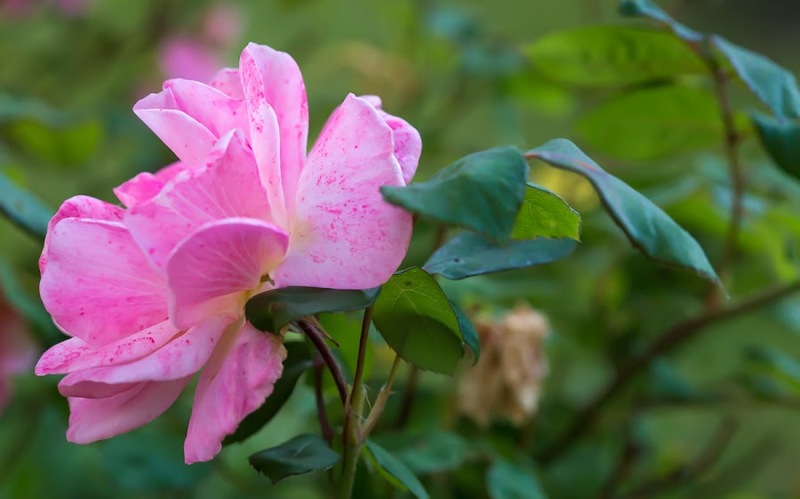 A rose in our garden. Later, at about three-thirty in the morning, I woke up to the muffled sounds of Tasha poking around in the room. Uh-oh. So I got up, got dressed, and took her outside. The rain had ended and the moon was shining brightly. Then, suddenly, the loudspeaker out in the vineyard screamed out with wild animal noises (to scare the deer). It wasn't enough to scare the you-know-what out of Tasha, but still, she turned tail and ran back into the house (and so did I). Then, after a while, more sleep. At five o'clock I opened my eyes and could see the back-lit silhouette of Tasha starting to crouch down across the room. I got up abruptly, startling her, got dressed (again) and whisked her outside (again). After a few minutes of sniffing around in the damp grass, she did her business. Tasha then trotted proudly back into the house (and so did I). What a night! When we picked up Tasha from the breeder's, the breeder gave us a lot of information, as breeders are wont to do. 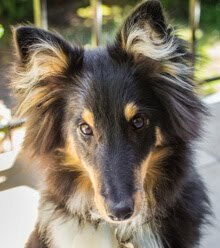 For example, she told us how Sheltie ears should be folded over, and if Tasha's ears tried to stand up, we should bend them manually and use glue if we had too. We're not doing that. 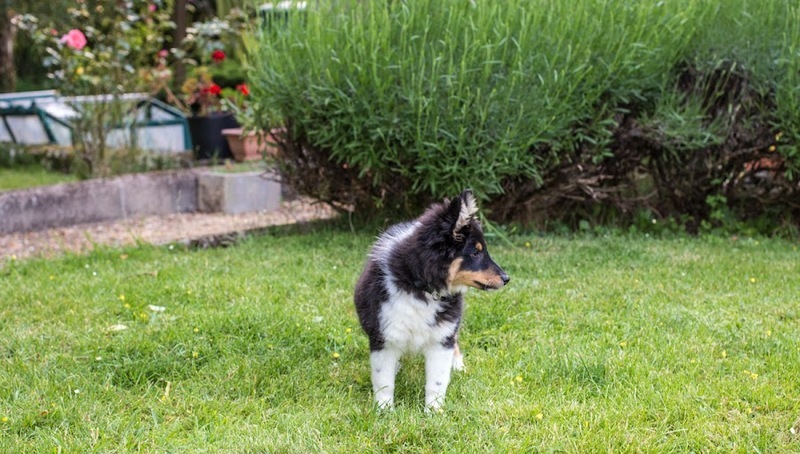 If Tasha's ears want to stand up, they are welcome to do so (she's not going to be a show dog). 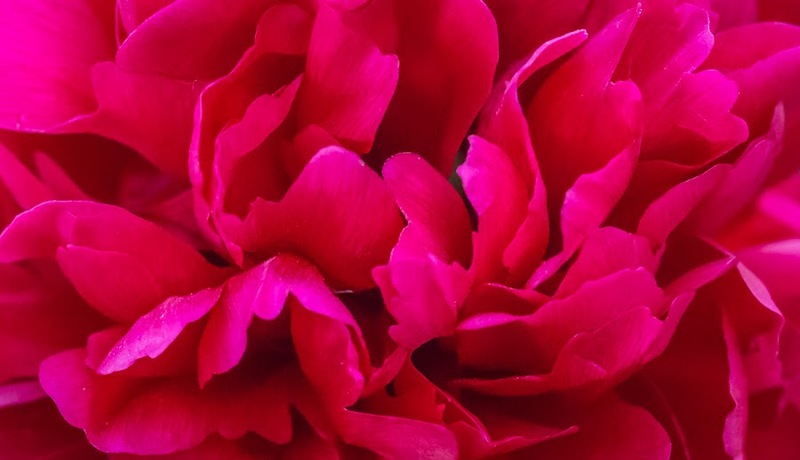 Close up of a peony, now blooming in our garden. Another thing she told us was more practical: feeding. 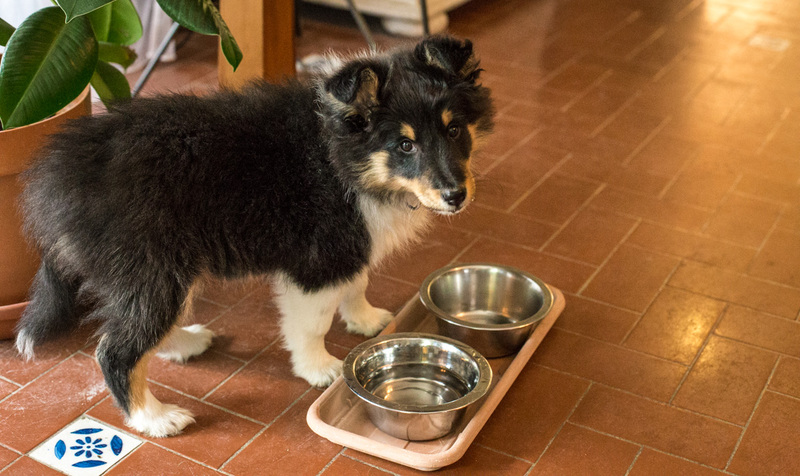 The breeder fed Tasha four times a day. One-quarter cup of puppy chow each time. Once we got home, we decided four times was too much trouble and that we'd do only three feedings a day: morning, noon, and night. So we did that. Then, after two weeks, I realized that feeding Tasha just before bedtime meant, well, that she'd need to "go" during the night. So we have just stopped the evening meal. Tasha now gets a good breakfast, and a good lunch. Then just a treat or two before bedtime. So far, so good. No more morning surprises in the loft? Hope springs eternal. 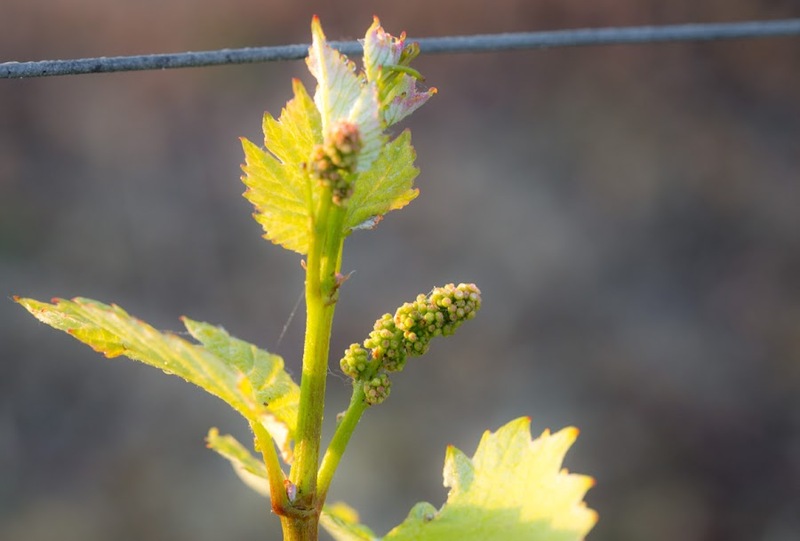 The first half of April was unusually warm and dry, and the trees and grape vines started to bloom and leaf out. Then the freeze hit. 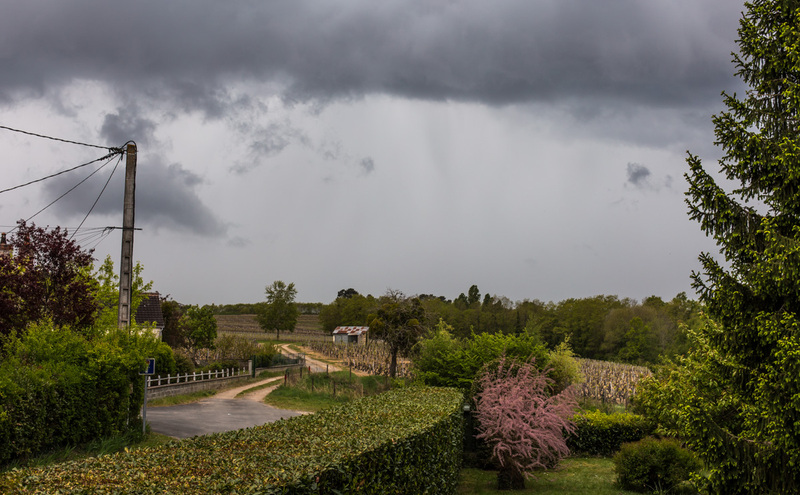 The greening of the vineyard was abruptly interrupted. It's starting to recover now, but the impact that the freeze will have on this year's harvest will likely be significant. This photo is from last week. The vines look a little greener now, but not much. The late April freeze was promptly followed by a couple weeks of chilly and wet weather which, unfortunately, coincided with Tasha's arrival. Being cooped up indoors with an active puppy and having to take her outside in the cold rain is not particularly fun (two reasons for not getting a puppy as winter begins). There have been some nice days, and we enjoy them because we can be outdoors with the dogs. Wednesday was beautiful and we got some outdoor work done (garden tilling, mowing, etc.). Callie and I haven't ventured into the piney woods in quite a while. It's really neat in there, but getting in is not easy. The edges of the woods are thick with small trees, bushes, and brambles. It's easier to get in and out on the far end, but a clear path through is not easy to find. We'll have to give it another try one day soon. 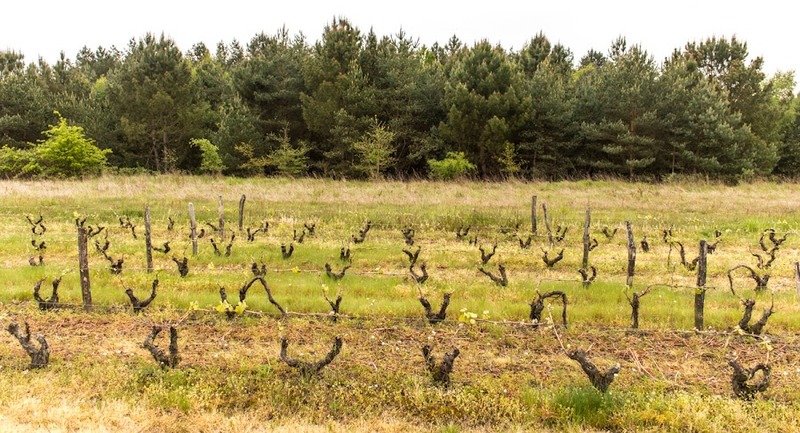 The piney woods, just beyond a small parcel of sauvignon blanc. With Callie. I think I'll try to post one photo of Tasha each week for a while and see how that goes. When Callie was a pup, I did "Puppy Pic of the Week." That evolved into "Periodic Puppy Pics," the fact that they weren't particularly periodic notwithstanding. Nous sommes deux sœurs jumelles, nées sous le signe des gémeaux. Not! 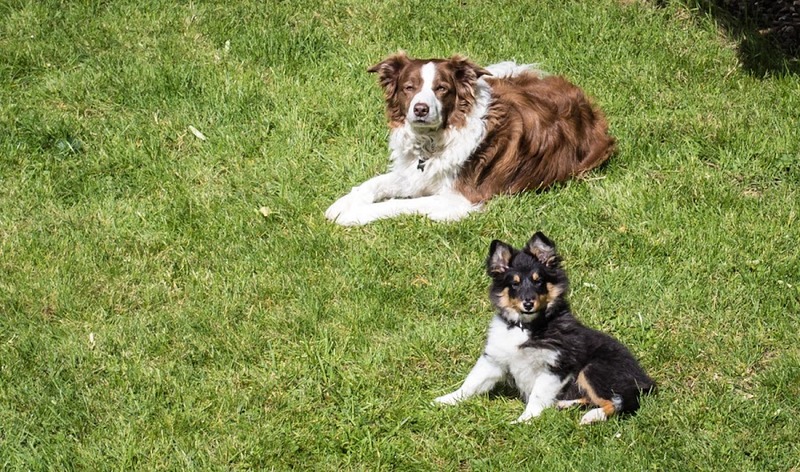 Both dogs were outside just before I cut the grass on Friday afternoon. I wanted them to sit together, but they would not have it. Until after I put the camera away, of course. This is the Artsy Organized Neighbor's "road to nowhere." 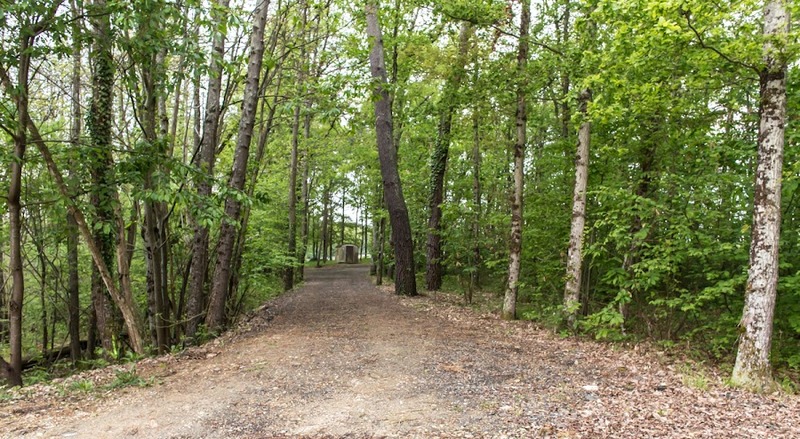 It connects to the vineyard road on the far end, but stops abruptly at the edge of a ravine (behind where I'm standing). It's part of one of Callie's favorite walks through the woods. The meticulously maintained road to nowhere. The French presidential race is finally over, as you more than likely know by now. I'm glad that the extreme-right candidate lost. It will be interesting to see how Macron's cabinet shapes up and what will happen in the National Assembly. The new president doesn't belong to any established political party and therefore has no seats, let alone a majority, in the assembly. Parliamentary elections are coming up next month. Like I said, it will be interesting. 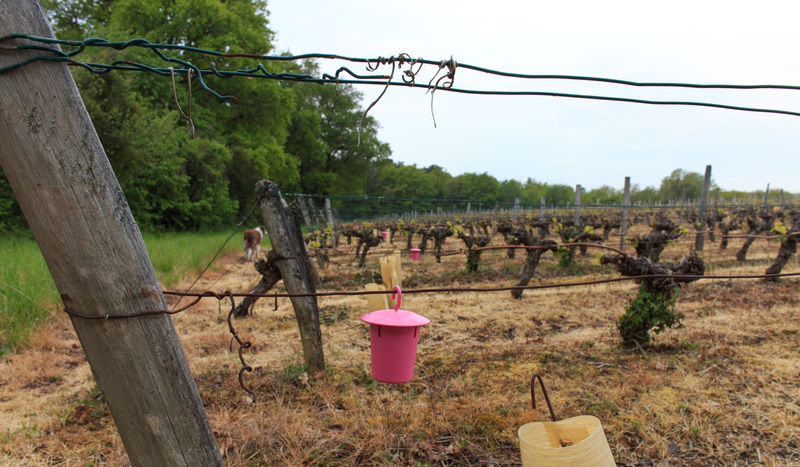 The other day, these mysterious hanging pots appeared in one of the vineyard parcels out back. The little pots are small, just a few inches tall, and they hang from the guide wires in every other row. They only hang at the edge of the vineyard parcel closest to the woods. My theory is that they contain some kind of chemical substance that is intended to keep deer out of the vines. The little pink pots have no effect on dogs, it appears. The growers around us employ several strategies to keep deer from munching on new leaves and grape flowers. Some of them string up red and white tape where deer paths exit the woods. I guess that the tape acts as a sort of visual barrier, especially when it flaps in the breeze, that frightens the deer. Other growers electrify fences along certain sections of the woods to keep the deer from crossing. One grower out back has a speaker that emits wild animal sounds to scare the deer away from a recently planted parcel. Now we see these pots. I wonder how effective each of these methods is? These little blue flowers grow close to the ground. They're blooming fantastically right now all through our lawn. I cut the grass on Friday, so a lot of the blooms are gone, cut away, but before I mowed, I took a couple of photos. The flowers will more than likely come back soon. 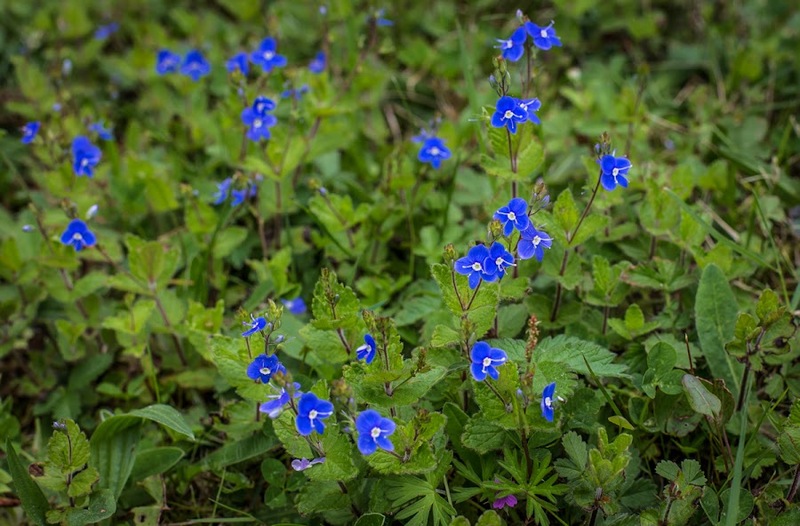 They're called véroniques (veronicas) in French, and the British call them speedwells. Our "lawn" is less grass and more little green plants, including these veronicas. It started raining at some point in the night and it's expected to rain most of the day. Ugh. I have to decide if I'm going to brave the outdoor market this morning for strawberries. Tasha just finished her lunch. She looked at me like Oliver Twist might have. Please, sir, may I have some more? That may not be the exact quote, but it's close enough. Lest you think me mean, she gets plenty. If you know dogs, you know they always want more. No more kibble. Just boring water. I finally did the thinning and replanting of tomato plants. It will be a few weeks before they go out into the garden. Tasha helped me by being underfoot in the greenhouse the whole time. I enjoyed it. Callie still gets her two walks a day, alone with one of us. Tasha is too small to do the kind of walks we do with Callie, at least for now. And that's a good thing, at least for now. 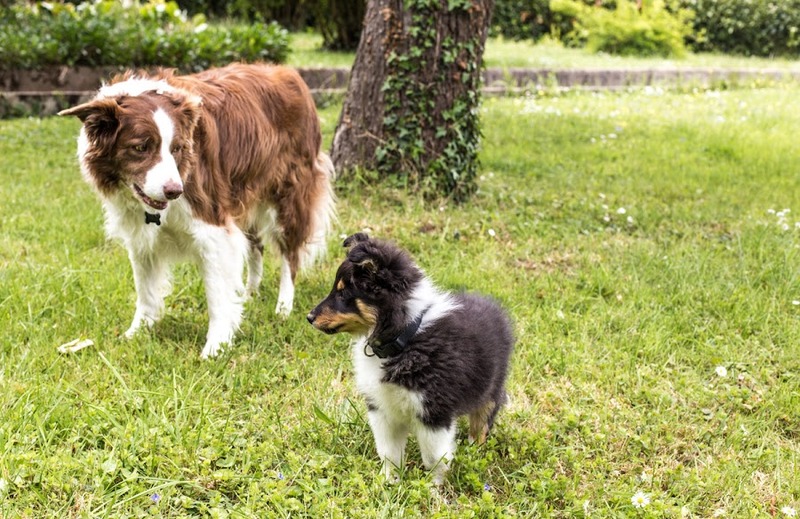 The daily walks are important and are a part of Callie's routine that she doesn't have to share with the new puppy. At least for now. A morning walk under threatening skies. Callie (on the left) waits for me to take the picture. We had rain off and on for most of the day on Wednesday. We were lucky on our walk to be in a lull. I usually don't take the camera out if it's going to rain, but I needed some new photos! Things are going along. We have our ups and downs, although the downs are few and not very serious. Tasha has been with us now for a week and she's learning very quickly how the house runs. We're establishing patterns for her; dogs love routine and predictable patterns. I think she's beginning to realize that after the night's sleep, we go outside for "business," so she waits. She made her first attempt at going down the stairs on Tuesday (she mastered going up the stairs a few days ago), but she's still too little to manage it safely. That will change. Part of the Artsy Organized Neighbor's collection. Meal times and play times and nap times are getting settled. Ken and I have our learning to do, too. I'm getting better at recognizing when she has to go out during the day. She and Callie are learning to play, or at least hang out, together. Tasha gets along fine with Bert, and they spend time in the house together in the mornings. Now it's a matter of reinforcing patterns. We did this ten years ago with Callie, but we didn't have another dog or a cat to help occupy the puppy and absorb some of its energy. Then, it was all on me and Ken. Now, Callie is a welcome help! I woke up just before 05h00 and noticed that Tasha was not asleep but moving about. That could only mean one thing: poopies. So I got up, got dressed, and got her down to the back yard. Fortunately, the rain had stopped, so there I stood in the dark (except for the light in the greenhouse) waiting for Tasha to find a spot. After about five long minutes she finally did her business. And there were no little "accidents" upstairs. Good dog! * It's not. It started raining again. They were just outside together. Then I brought Tasha back into the house. She stayed by the door watching Bert, so I got the camera. I'm sorry for the state of the windows, but I haven't done the spring cleaning yet. Still, I think it's a nice shot. 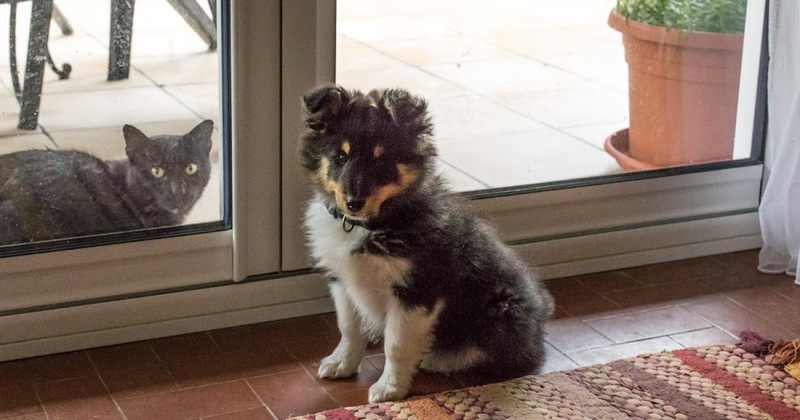 Bert wonders why the newcomer can be in the house but he can't. Poor kitty-kat. The rain and wind came as predicted on Sunday afternoon. We've been inside, playing with socks and ropes and bones and balls. Tasha's not fazed.